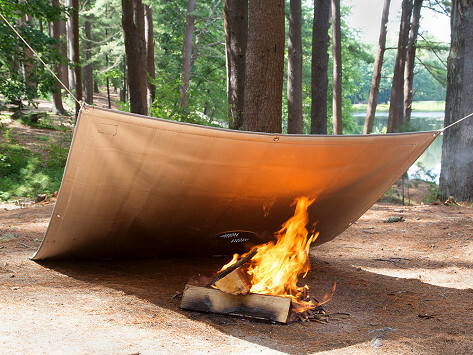 This large vented campfire cover can keep embers warm for up to eight hours and protect fires from the elements. It also can act as a shield for the surrounding area by blocking blowing ash and smoke, or as an added safety measure on top of extinguished fires. Glow in the dark stakes and a flashlight help make nighttime use easier, too. Dimensions: Folded: 20" x 16" x 5"; Open: 68" x 60"
Campfire Defender’s tough and durable campfire covers can keep embers warm overnight and protect them from the elements. The covers also can shield nearby areas from a fire’s blowing ash and smoke. When the fire is extinguished, they offer an extra measure of safety, too. 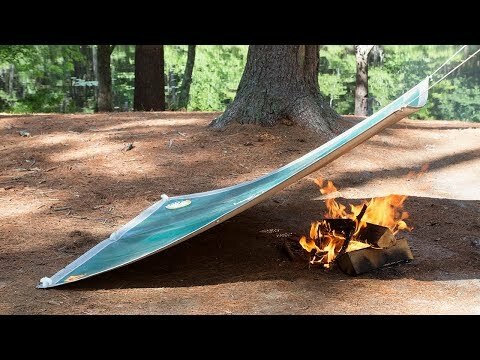 If camping isn’t your thing, the covers work just as well with fire pits. A built-in air vent helps keep fires warm while covered. Made from military-grade fabric coated in woven glass with a high-temperature silicone polymer, these covers can handle heat up to 2500 degrees Fahrenheit—much hotter than a typical campfire gets. Since they’re so rugged, it’s no surprise they withstand rain, snow, and wind, too.